If I’ve learned one thing in my frugal cooking experience, it’s how smart old people are. Really. I think of all the things our grandparents did that people have laughed at over the years – washing their freezer bags, refusing to get credit cards, using that old seventies sofa until its exposed springs were a tetanus hazard. Then I look at these new blogs popping up every day, and I can’t help but laugh all over again. We’re suddenly realizing that our grandparents were pretty smart. They might not have a huge Twitter following (let’s face it – most of them are pretty savvy members of Facebook now), but many of them have wise ideas about handling and saving money. They were delicious. Turns out the past generations knew a thing or two about whole food cooking as well as money. 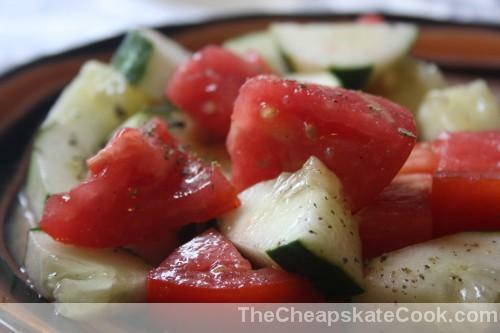 This recipe was inspired by my Greek thea who served us this dish fairly regularly. She used a pressure cooker and I use a slow cooker; she boiled the meat and I brown it. But the basic recipe is the same, and the result is a savory, tender roast that only requires a few frugal ingredients and absolutely no processed ones. Making this dish not only reminds me of my husband’s – and now my – Greek heritage, it also reminds me that I have a lot to learn from those people who do crazy, wise things like wash freezer bags and refuse to get credit cards. Pour half of the oil in the bottom of a large skillet and brown the roast on the skillet, using tongs to carefully flip it over and brown it on all sides. Place browned roast in the bottom of your slow cooker and add tomato juice, cloves, peppercorns, and cinnamon. Pour the rest of the oil into the skillet and sauté the onions until translucent. Pour the onions on top of the roast, scraping the sides of the skillet to get any extra oil or fat to add to the slow cooker. Cover and cook on low 6-8 hours. Add salt and pepper to taste and serve over brown rice (with a Simple Greek Salad, if desired). When Steph and her husband got married, they lived in a renovated shed and had a grocery budget that matched. As a passionate whole-foodie, Steph was determined to continue eating healthy, minimally-processed foods on their shoestring budget. So The Cheapskate Cook was born. If I don’t have whole cinnamon sticks, peppercorns and cloves on hand, could I used ground? Yes, you definitely can use ground. Don’t use too much cloves, though! The flavor is stronger from the ground spices. I would start with 1/4 teaspoon of cloves and 1/2 teaspoon of pepper and cinnamon. Thanks Mary! I made this today. I wish I could post a picture. It was so good. I used V-8 instead of tomato juice and I added a bay leaf. I could smell the cinnamon and cloves as it was cooking. But couldn’t taste it much in the meat. But it was exceptionally tender. I’m so glad you liked it, Nancy! Thanks for sharing your review here. If set to high, how long should it take? As a general rule, you can cook things in half the time on high. I just put it in the crock pot. I can’t wait to eat it before the debates tonight. Thank you for sharing! Thanks! 🙂 I think it sounds good too….Steph knows her stuff. 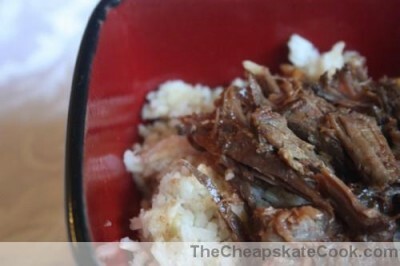 Your Crock Pot Greek Roast looks delicious. I just love the flavor combination and can’t wait to try it. Thank you so much for sharing your awesome recipe with Full Plate Thursday. Hope you have a great week and come back soon! It’s a different blend, but people seem to love it! Great combination of flavours. I’ve pinned this for future reference. Delicious, Looks perfect. Thanks for Sharing with Hearth and Soul blog hop. I’m allergic to tomatoes, think I could use broth instead? Cinnamon! That sounds awesome. I wish my husband could eat tomatoes b/c I would definitely make this. 🙁 But I think I will try cinnamon with beef in some other configuration because that just really intrigues me! You can try subbing stock or broth, Anne! This looks interesting… I’ve never had a pot roast that uses cinnamon before. Me either, but this sounds awesome! The cinnamon is a pretty mild flavor. I was surprised to find out it was in there. If you’re skeptical of it, you can use less, and rosast still turns out great. Hmmmm…. the cinnamon and tomato juice is an interesting combo that I wouldn’t have thought of. I need to dig around in my deep-freeze and see if I have a roast hiding in there. Thanks for sharing Steph! Holy wow. I MUST make this soon! Making mine, I didn’t brown the roast or cook the onions first, because I’m too lazy today. LOL I’m still unsure about adding the cinnamon since I have picky eaters. I’d love for Stephanie to come chime in about it. 😀 I’ll let you know how it turns out! Glad you like the sound of it! We don’t do roasts very often, but this is so simple and delicious. Becca – I’m sure you can leave the cinnamon out if you prefer. However, it adds a very mild flavor that compliments the beef without being too strong. Using less or leaving it out shouldn’t hurt.